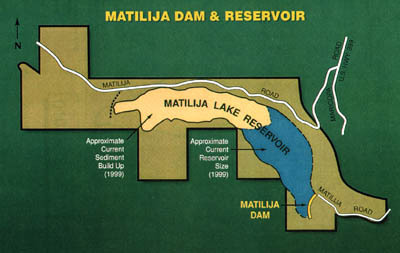 Over the past half century the capacity of the Matilija reservoir has been reduced by over 90% mainly due to the 6 million cubic yards of sediment trapped behind the dam. This has rendered it an obsolete structure that no longer serves a purpose for flood control or water storage. 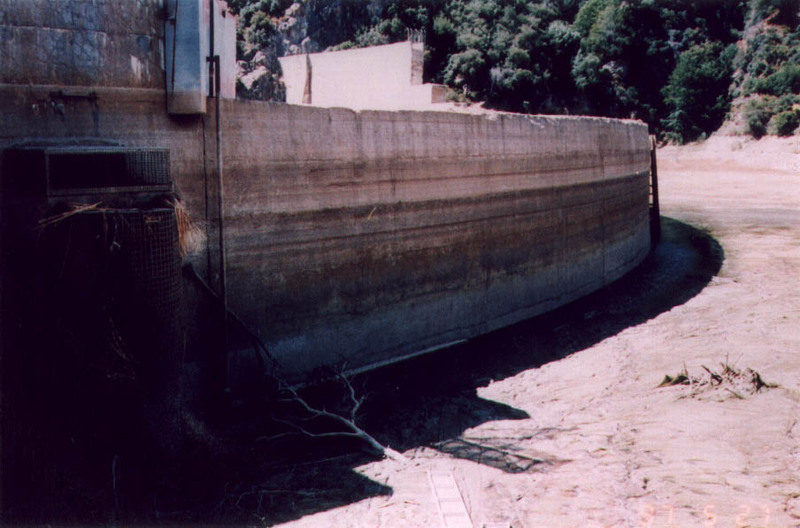 The dam's effectiveness as a sediment trap has resulted in the erosion of beaches downstream that rely upon the Ventura River. These problems were predicted before, during, and after the construction of the dam, (see history) and today we are witnesses to the results. The reservoir storage is predicted to be zero by 2020. Current estimates place the sediment volume impounded by the dam at approximately 6 million cubic yards. Over half of this volume is sand, once destined for the beaches of south Ventura County. 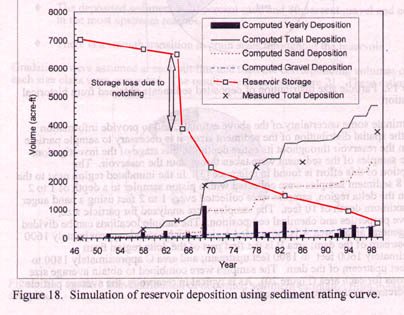 This figure shows the historic storage volume and sediment deposition of the reservoir. The reservoir storage is predicted to be zero by 2020. 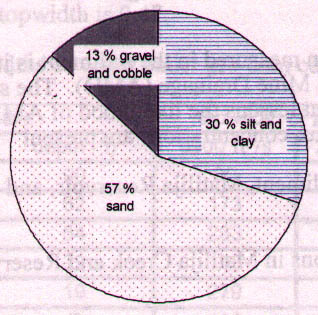 This figure shows the compostion of sediments trapped in the reservoir. The dam traps the coarse particles (sand, gravel, and cobble) which settle out in the reservoir, while passing much of the finer silts downstream. This not only impacts the beaches, but also the biological integrity of the lower reaches of the Ventura River which now lacks gravel spawning beds for fish. ©Matilija Coalition, All Rights Reserved, 2002.